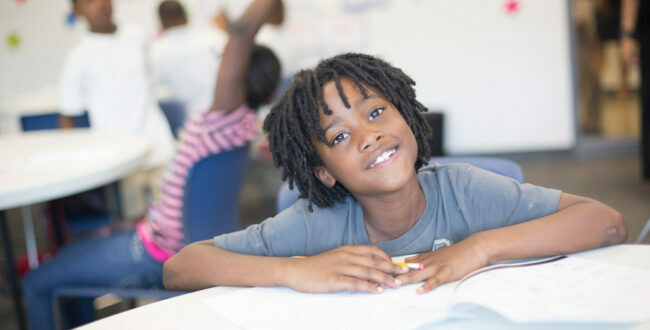 By The Hand Club For Kids is a Chicago-based after-school program that provides tutoring and support to children and teens in the city’s most under-resourced neighborhoods, including the Austin community. By The Hand Club emphasizes academic excellence, with a focus on raising grades and standardized-test performance, while nurturing mind, body, and spirit. “Our mission is to take kids by the hand in first grade and walk with them all the way through high school, supporting them until they can walk independently,” said Donnita Travis, founder and executive director. Since 2009, the McGowan Fund has walked along with By The Hand Club, helping to expand services and grow the Austin program. When the Fund first started supporting By The Hand Club, Austin served 176 children in first through eighth grades. In 2013, Austin served 264 first through 12th graders in a newly constructed, 26,000-square-foot building. “They’ve helped us grow with our kids. We now have a college prep program and our first class of Austin high school graduates, 88 percent of whom are in college this fall,” Travis said. Because literacy is closely linked to academic success, By The Hand Club recently launched a comprehensive literacy program with the McGowan Fund’s support. Each site now has a reading specialist who works one-on-one with kids to improve their vocabulary, grammar, sentence formation, and comprehension. As a result, 34 percent of all Austin kids and 96 percent of kids who have been with the Austin club for four consecutive years experienced an increase in their ISAT Reading performance.